There's a fresh crop of fall cookbooks hitting stores, and in the coming weeks I'm going to highlight a few of the stand-outs. 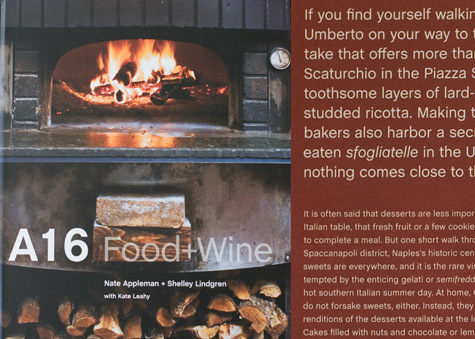 I'll start with a cookbook from my home turf, A16: Food + Wine. A16 is a much-loved San Francisco restaurant with a menu and wine list that celebrates Southern Italy, and to a greater extent the Campania region. One of the exercise classes I take is located just across the street from A16. A few times a week I find myself en route to a workout, walking up the south sidewalk, when I inevitably collide with the aromas spilling from their front door out into Chestnut Street. And for a few hours the other day, my kitchen smelled just as good. The recipe I'm highlighting is a beautiful, hearty stew that incorporates all manner of colorful summer produce - cherry tomatoes, zucchini, eggplant. I chose it because of its seasonality, but also because it uses a cooking method I've never tried before - more on that in a bit. I want to tell you a bit more about the book itself, and then we'll get into the cianfotta. "...There are famous attractions in Campania - Pompeii, Sorrento, the islands of Capri and Ischia, the Amalfi coast - yet southern Italy remains largely removed from the usual tourist route, a lapse that has helped preserve its food traditions. Today nearly every restaurant in the center of Florence has menus printed in English, French, and Japanese, while you are lucky to be handed a menu at all in Campania. The international popularity of Naples-style pizza notwithstanding, it is still rare to find regional foods, such as the maccaronara pasta native to the Irpin hills, served outside of the region...At 16, we translate rustic Campanian cooking to a San Francisco setting. 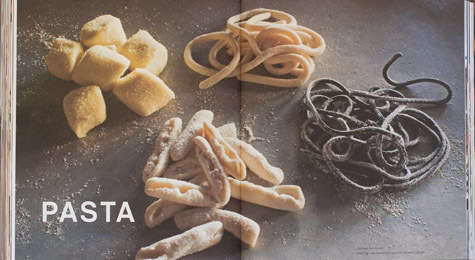 Just as Italian cooks work with the best ingredients they can acquire, we source the finest local and seasonal produce we can find and treat it in an Italian manner..."
After an initial introduction, the book dives into a robust, 60+ page southern Italian wine primer - itself worth the price of the book. It then moves onto the food section; pantry, antipasti, pizza, zuppa, pasta, seafood, poultry and meat, the pig, vegetables, and dessert. Whether the authors are talking about grapes, ingredients, or road trips, the text is genuine and enthusiastic in tone throughout. The end result is infectious - I read the book from cover to cover in one sitting, and now I have a list of wine producers I'm excited to track down, and recipes to try. I should also mention that Shelley helpfully offers up wine pairing suggestions to accompany with many of the recipes in the book. There is plenty of vegetarian inspiration here, and aside from the meat-centric chapters, many recipes are easily adaptable. The book was photographed and designed by Ed Anderson, printed on nearly three hundred pages of uncoated paper - no question, it's a looker. The cianfotta, a traditional vegetable stew, caught my attention not only because it is packed with summer produce, but because the cooking method is so dramatically different from the way I normally approach summer vegetables. Often I flash cook vegetables, just enough to take that raw edge off. For this stew we are instructed to braise the vegetables for about forty minutes in two cups of olive oil. Most of the oil is then drained off before you go on to make your broth, and I have to tell you, this approach lends a deliciously glossy, luscious texture to the vegetables unlike anything else I've tasted. Fiorelli are the flower buds that eventually grow into squash blossoms - if you can't find them don't let it stump you, just leave them out or use squash blossoms which are more readily available. Shelley recommends pairing this stew with Frappato/Nero d'Avola Blend (Sicily). The also include instruction for making this stew with a prosciutto broth, but I opted for the vegetarian version. Serves 8 as a first course, or 4 to 6 as a main course. A bejeweled platter of bulgur wheat,chili roasted tomatoes, caramelized onions, spinach, and yogurt cheese. A perfect companion for grilled kabobs.